On Monday, March 27th, Attorney Chris Davis was invited to the KIRO 97.3 FM studio to talk with Dave Ross about the laws affecting teenage drivers and their parents. Mr. Davis is the author of the report Teen Drivers & The Law: What Every Parent in Washington State Needs To Know About Parental Legal and Financial Liability For Auto Collisions Caused By Teen Drivers. There are a number of laws in Washington state that affect teen drivers, and a few ways that parents can be affected in the event that their child causes an auto accident. As a parent himself, Attorney Davis knows that the teenage years are stressful enough without additional worries about what parents might be responsible for if a teenager gets into an accident while driving the family car. Individual booklets are available for parents of teenagers in Washington state. To order your free booklet, go to our order page for parents. These booklets are completely free through Davis Law Group’s Washington Accident Books™ program; parents do not have to pay for anything. Our Washington Accident Books™ are intended as educational tools. Each year, we distribute thousands of books to high school teachers, driving school instructors, and traffic safety educators. We also send books to bike shops, auto repair shops, health care providers, and other business which help accident victims. Our most commonly ordered books are available in bulk for educators and businesses. Again, we won’t charge you anything to send these books; all Washington Accident Books™ are part of our free educational outreach program. 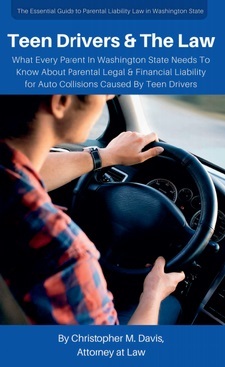 Teen Drivers and The Law: What Parents Need To Know About Legal & Financial Liability: This book is a popular choice with driving schools and high school teachers. The booklet covers common questions about how insurance works when a teenager is driving the family car, whether parents are financially liable for damage caused by a teenager, special laws and restrictions that apply to minors in Washington state, and other legal considerations that parents need to know. The Ten Biggest Mistakes That Can Wreck Your Washington Accident Case: This is Davis Law Group’s most popular book. It was written by Attorney Davis in response to the most frequently asked questions that he heard from friends and clients about personal injury law; it also details the most common mistakes he sees injured victims making after an accident. The Glove Box Accident Kit: This pamphlet is small enough to store in a car’s glove box. It contains a thorough but simple checklist of everything an accident victim needs to do in the moments after a collision. It also includes a form that an accident victim can use to fill out all the details they need to know about the other party’s insurance, the circumstances of the accident, road conditions, and other important information before they leave the scene.